In 1906 when noted Southwest architect Henry C. Trost designed a home for the Joseph E. Curry family, Arizona was still six years away from statehood. Mr. Curry was chief clerk for the Calumet & Arizona Mining Company, one of three major mine operations in Bisbee. 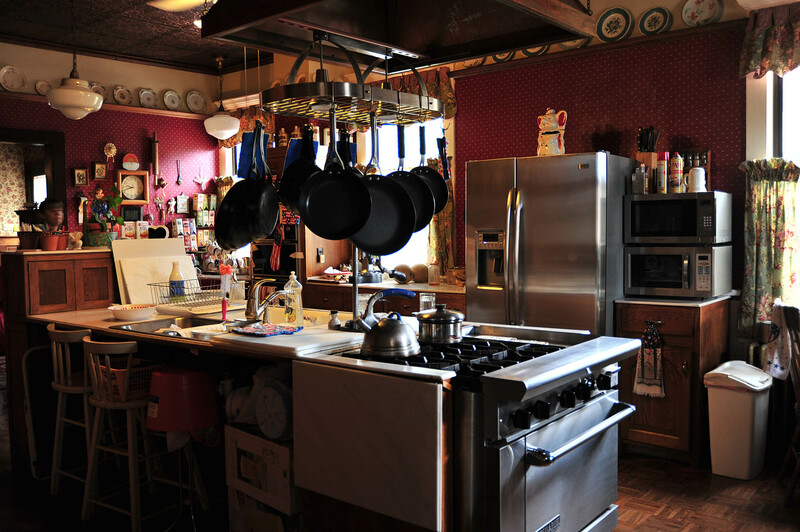 Warren, where the Curry home is located, was a separate district of Bisbee, an area where mining company management hoped to create a “more placid” environment than was possible in the smoky, noisy, raucous community just a few miles to the northwest. One of the earliest “designed” towns in the western U.S., Boston architect Warren Henry Manning’s plan used the ball field that still stands at the south end of the Vista as a hub for Warren’s streets (similar to Washington, D.C., where the Capitol forms the hub). 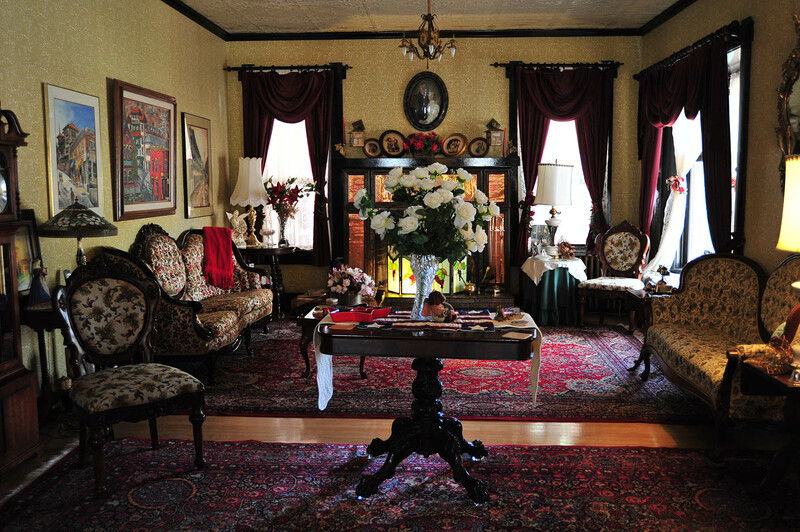 The Curry home was constructed soon after the railroad arrived in Bisbee. Builders were able to avail themselves of materials otherwise rare before the iron rails stretched from El Paso to Bisbee Junction. Woods of different kinds- some finely crafted and finished- were generously incorporated as trim, flooring, wainscoting and cabinetry. Bathroom fixtures and door hardware were of a type seldom seen in the west, particularly not in isolated mining communities. 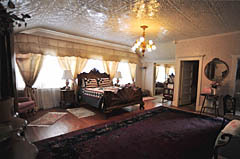 Not long after Arizona achieved statehood in 1912, the “C&A” company acquired Joseph Curry’s house and, altering it to reflect the increasing amount of money available to the mine owners, made use of the newly renovated facility as a guest house for visiting VIPs. Millions of dollars poured into Bisbee as quickly as millions of tons of ore streamed out of the mines during WWI. By the early 1920’s, times had changed. Phoenix and Tucson were attracting more residents, altering the political balance of Arizona. Mining was still the state’s economic backbone but copper towns such as Globe, Miami, Bisbee and Jerome no longer controlled legislative affairs. Life was slowing down in Bisbee and for the Curry House. 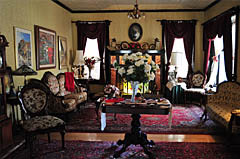 After passing through a few owners and experiencing many alterations, the Curry home became the residence of John and Joy Timbers in 1977. 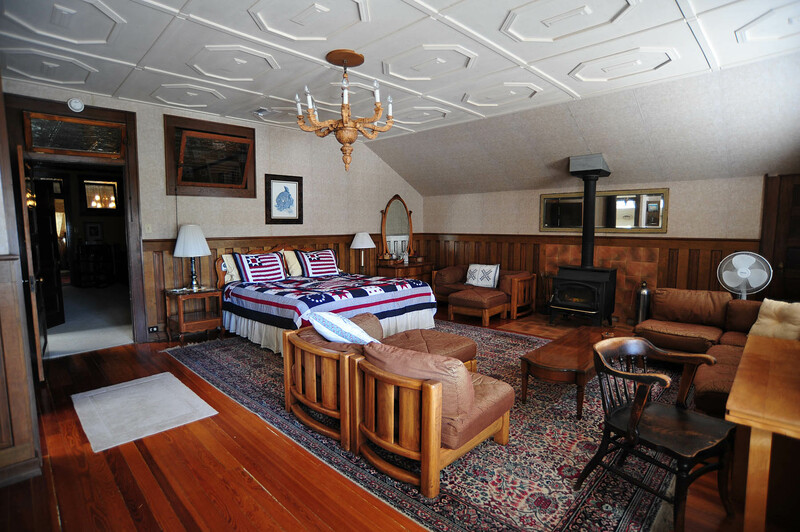 Since that year the Timbers have conducted a careful restoration and enhancement of the home and its grounds. Its development has stretched from years to decades. The garden which was originally merely a frame for the house became a captivating project in its own right. Terracing, massive walls and rocks, impart a bold three-dimensional texture to the grounds and compliment the massive lines of the structures. 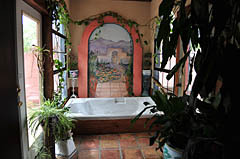 Mostly lush desert flora has been selected, to which our particular Southwest zone is friendly, as well as suiting the home’s Mission revival theme. 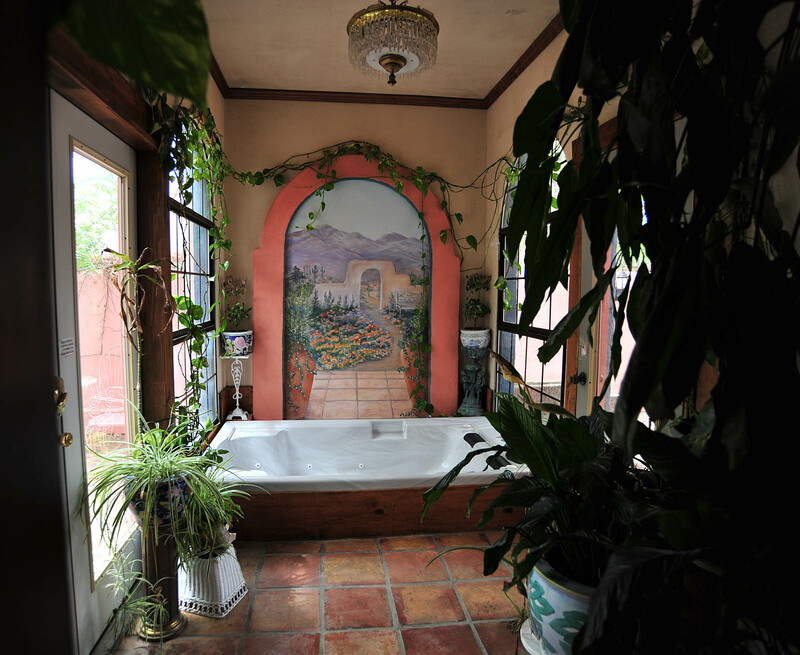 And, just as it was when Henry Trost designed the structure, Warren is still a tranquil environment only minutes from the noise and bustle of downtown Bisbee. Guest rooms range in size from 150 sq. feet through a spacious 500 sq. foot master bedroom. 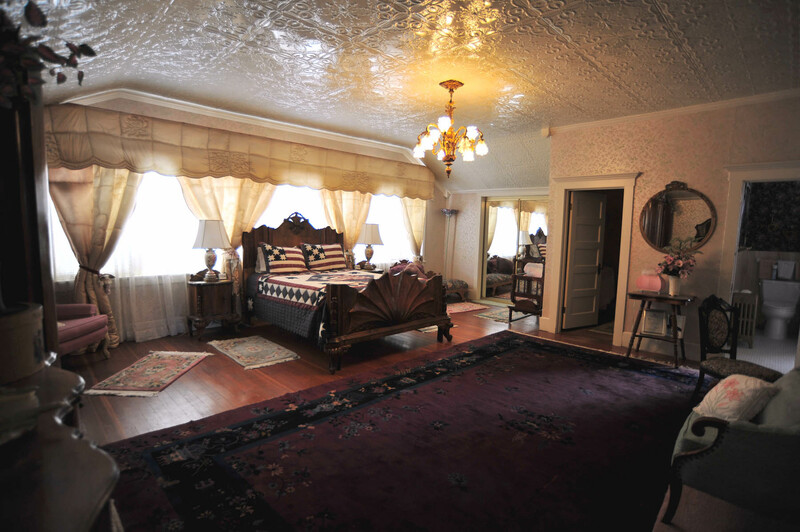 As you can see in the row of photos to the left, every room is magnificently decorated. Period wallpaper adorns the walls and antiques, from collectable grade to family heirlooms to museum quality are on display throughout the home and in the bedrooms. 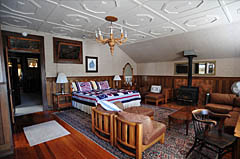 All rates include a full breakfast, cooked to order, and served in the elegant dining room. 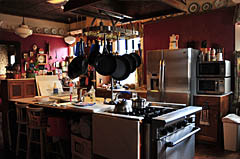 (Both dining room and kitchen are pictured to the left.) 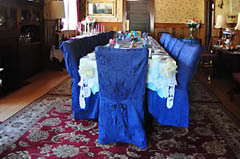 Guests may select their breakfast from a menu which includes fresh fruit salad, juice, coffee, tea, milk, bacon, eggs, cottage fries, homemade granola, french toast made with homemade whole wheat bread, broccoli/cheese quiche, crepes filled with scrambled eggs topped with an Holandaise sauce, eggs Benedict and homemade toast and jellies. Out back of the house, a magnificent garden complete with stream, pool and fish is almost complete, awaiting guests who wish to relax in the sun. A patio on the north side of the house is idea for evening events--such as weddings--or for outdoor luncheons or dinners. On the south side is a secluded walkway leading to the garden. Copyright © 2011-2012 bisbeeaz85603.com. All Rights Reserved.